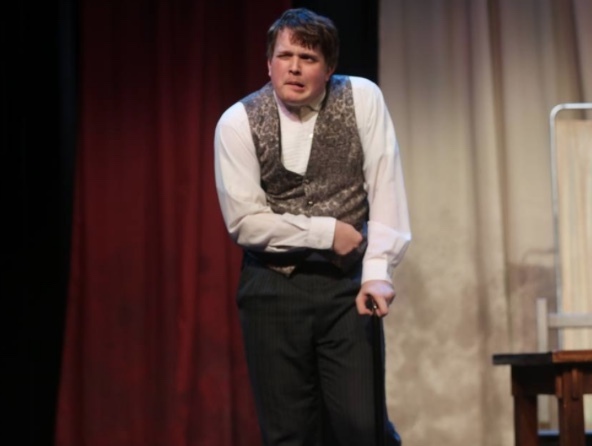 Cooper Summers (12) transforming into the elephant man during the play. Yorba Linda High School’s theater program has done it again. This year’s winter play, The Elephant Man, was an amazing production. Yorba Linda High School’s theater students that participated in the play did a wonderful job at recreating The Elephant Man’s story. The doctor then let the elephant back into society after examining him, where he was quickly picked on and bullied. These people even stole his money. He was left on the streets bruised and broken. It was not until the doctor found him on the side of the road was he then taken into the nursing home. He was nursed by multiple people at the facility, and got a famous actress to come and visit with him, played by Nicki Stewart (11). Throughout the rest of the play, Nicki Stewart’s character visits and cheers up the elephant man. She is with him until his last few days, but could not stay around for much longer because she could not bare to see him die. While she was there though, they talked about her shows and love. The elephant man then mentions a scene in Romeo and Juliet to her. They then have a debate about the final scene and how Romeo judges Juliet is dead, by testing her breath to a mirror. He claims that that method is not a valid way of validating someone’s death, and therefore they were not in love. The last few scenes of the play is when the elephant man dies. He was suffocated in his sleep. His whole life he could not sleep laying down because his head was too big and would suffocate him. In his final attempt of trying to live a normal life, the elephant man went to bed laying down, and died of suffocation. Overall, everyone in this production did an amazing job on the play. Their hard work was obvious throughout the entire show. Great job to Ms. Petz (Staff) and the entire cast. The entire school cannot wait for what’s next. Comments are screened and must comply with our basic rules before we will post them. The basic rules: 1. Comments that use foul language, are obscene, or sexually-explicit will not be posted. 2. Threats will not be posted. 3. Hate speech and bigotry is not tolerated. This means no racial slurs, name calling, or personal attacks. 4. Spammers are not tolerated and will be blocked.